In Latino culture, Quinceañeras are an important tradition that highlight the bonds of family, community and culture and that bring people together through celebration. This is the spirit of Quinceañera at the Capitol: to celebrate the resistance against SB4 by highlighting our commitment to our communities and culture. After all, SB4 isn’t just about politics: it will sow fear and distrust into our neighborhoods and break apart our families. Join us at the South Steps of the Texas State Capitol on Wednesday, July 19, from 10:00 AM – 10:30 AM to rally around 15 young women who will honor Latino culture with dance and share why they are fighting against SB4. 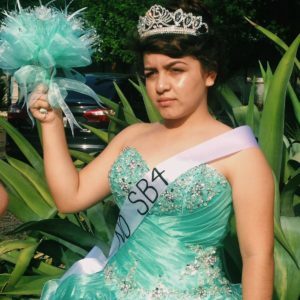 You can also be part of Quinceañera at the Capitol by sharing a photo of your Quinceañera and telling us why you stand against SB4. Use the hashtag #15ContraSB4. SB4 was signed into law by Texas Governor Greg Abbott on May 7, 2017. The law makes being undocumented and brown a crime in Texas: local law enforcement will be able to question the immigration status of residents and will have to aid in the deportation of undocumented Texas. SB4 will result in racial profiling and the increased policing of communities of color. It will cause too many families to be separated through deportation, and will drive victims of crime into the shadows. SB4 is a law that is rooted in white supremacy, and those who support it seek to gain political power by scapegoating immigrants and people color and by fomenting hate against our communities.